I'm bumping this post up which I did in January, as a reminder to artists working on something. We have a little over a month. Celebrations take planning. On September 25th of 2017, we celebrate the 200th anniversary of Izannah Walker's birth. Inna Razuvaeva, Russian doll maker, suggested in the MAIDA Dolls Group that we plan to celebrate by creating something for September 25th this year. 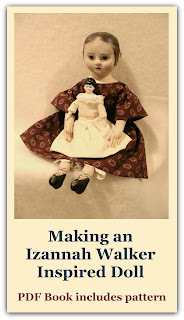 I created this blog as the resource I wish existed when I first started studying Izannah Walker's dolls. I had bought all the books that had Izannah Walker doll pictures in them. At that time, there were very few pictures of Izannah Walker dolls online, less than 10 dolls. 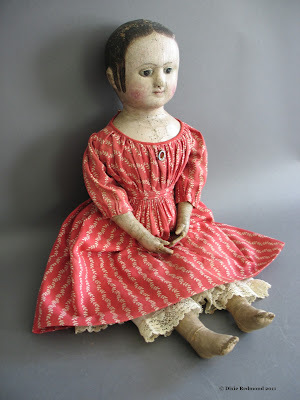 So I started traveling to document dolls and post them here as a resource for doll makers and those who love folk art. That's how this resource was created. Design an Izannah inspired fabric through Spoonflower. See mine here. Make a doll sized quilt. Designs a new piece of clothing or accessory to go with your Izannah Walker Doll. Make a modern one of a kind doll which uses Izannah Walker's techniques but does not look like an Izannah doll. These are just ideas to prime the pump. Come up with others and leave a comment. Oh I absolutely must get busy with my Izannah doll kit!! Hello, I have only just found this site; last year I was introduced to Izannah Walker and her dolls and have come to love her and her creations. I am fairly new to doll making, but am giving it a go. Can you help me with my question. I am beginning on a cloth doll of Izannah's style, and am wondering if stuffing her with sawdust would be best or something else? I thank you for your time and look forward to visiting here again. Hi, Vivian - Izannah used a variety of stuffings. In my doll, some stuffing is cotton/thread and some parts are more crunchy - kind of like excelsior or seagrass. I've never seen or heard of a doll with sawdust. Izannah lived near textile factories and the sea, so had access to lots of surplus materials, and probably used what was available at the time.